This week, Lennard Zinn addresses questions related to braking systems from the 1960s and follow-ups to frame fatigue. Recently, a friend sent me post cards from the cycling shrine at Madonna del Ghisallo, Italy. One pictures the bicycle ridden by Gianni Motta in the 1966 Giro d’Italia. The bike has side-pull brakes. 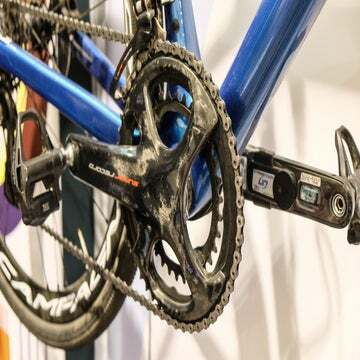 The cable tension screw on the levers looks like the system used on Universal brakes. But I recall that Universal was only making center-pull brakes, which were all the rage until Campagnolo came out with their side-pull in 1968. I am the original owner of a 1965 Masi Special that has Universal center-pull brakes. It is strange; when I started racing in the late 1950s, side-pull brakes were the only thing around. Then the fad went to center-pull (and recessed headsets, too) and back again to side pull. 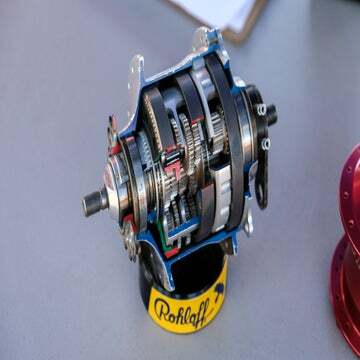 Do you have any idea what brakes may be on the Motta bicycle? I’ll bet those are Universal, which did make side-pull brakes and were the low-cost alternative to Campy Nuovo Record side-pulls at the end of the 1960s. They were light weight and had very thin, flexy arms; they offered very low braking power compared to what we are now used to (or to Campy brakes of the 1970s). My roommate in college in 1977 had some Universal side-pull brakes on his otherwise full-Campy Cinelli that he had bought used, so it was probably late 1960s vintage. In regards to your recent Technical FAQ about fatigue life of aluminum, this photo might give your readers pause and send them off inspecting their aluminum frames immediately. I found this while washing the bike. I don’t know how long it was like this, and we had just finished a week-long trip along Lakes Erie and Ontario, riding every day. I shudder every time I think of it. Having taken several materials classes in my engineering school days, I have always understood the fatigue issues with aluminum, and I always did look the bike over when I washed it, but I should have been even more diligent. In this case, luck won out. The bicycle is (was) a 2004 Burley tandem, with about 15,000 miles on it. A related question — what are the fatigue characteristics of carbon fiber structures? My only experience with composite materials is reinforced concrete. While carbon fiber composites can have very high strength-to-weight ratios and high elastic modulus (hence, high stiffness), they do not have a definable fatigue limit or endurance limit. Thus, fatigue failure is, in theory, possible with carbon parts, but since the strength of the part can be so high, this can keep the stresses still well below the S-N curve for a carbon part. I’ll let the pioneer in carbon bicycle frames, Craig Calfee, answer your question more completely. Composites are very different when it comes to fatigue failure. Theoretically, because the strength of carbon fiber is so high, designed stresses would never approach the yield strength, (which is almost the same as the ultimate tensile strength because carbon fiber is so brittle). A well-designed (and well-built) carbon fiber component will never fail under normal loading. But a stress concentration can be built into a poorly made component, rendering that area prone to a fatigue crack. The failure mechanism starts with the epoxy matrix, which starts microcracking in the high-stress area. That starts rendering the epoxy ineffective as a matrix for the carbon fiber and soon results in the fiber starting to break. This is when the fracture starts to be visible on the surface. Note that the vast majority of composites failures make their appearance on the surface because that is where the maximum stress is located when caused by a stress riser. Once the fiber starts to break, the component will soon fail catastrophically, not giving nearly as much warning as metals do. If a component is designed for lowest possible weight without margin for typical abuse, minor manufacturing errors, or subtle changes to the design, a very small gouge will become a stress riser that will lead to a failure. This is why we stay quite busy with our carbon repair service. A component designed with a margin for this type of real-world experience will last a lot longer because a small, unnoticed gouge will not progress into a full-blown crack. I was quite put off by the answer you gave to Gary when he asked about whether having ridden 24,000 miles on his frame so far should worry him that it won’t last through some touring. The answer you gave seemed to be something like, “well, aluminum will eventually fail. I don’t know when it might happen, so you should get a new frame now.” What frame of reference are you using for that? How much stress is a frame actually experiencing in different situations? And how many cycles might occur per, say, 1,000 miles of riding? 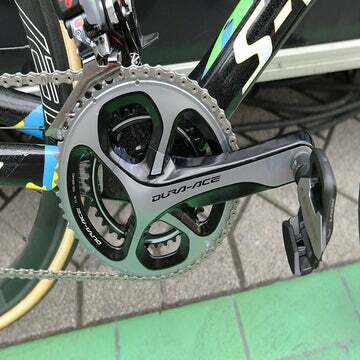 Personally, I don’t know what rider weights, uses, and impacts can cause a stress of, 10ksi, or 20, or 50. Do you? What if everything but a hard crash causes <1ksi? The whole subject of fatigue limit wouldn’t matter one bit. Your reading of my answer is different from mine. Gary is planning an extended loaded tour on a bike that he had ridden 24,000 miles on, some of it loaded touring, and he is concerned about whether his bike will make it through. I was answering from the perspective that he may be better off getting a new frame than having that worry in the back of his head detracting from the awesome trip he is embarking on. I am sure he doesn’t want to find a crack on his tour like the first reader in today’s column. Since I know nothing about how heavy or strong Gary is, what kind of road surfaces and terrain he rides on, how heavily his packs are loaded when he tours, what his riding style is like, and what tubes his frame is made out of, I cannot begin to approximate the magnitude of the stresses his bike has been subjected to in absolute terms. I can tell you that in terms of fatigue testing, each pedal stroke is considered a stress cycle, so that is quantifiable if we were to know Gary’s average cadence over all of those miles. 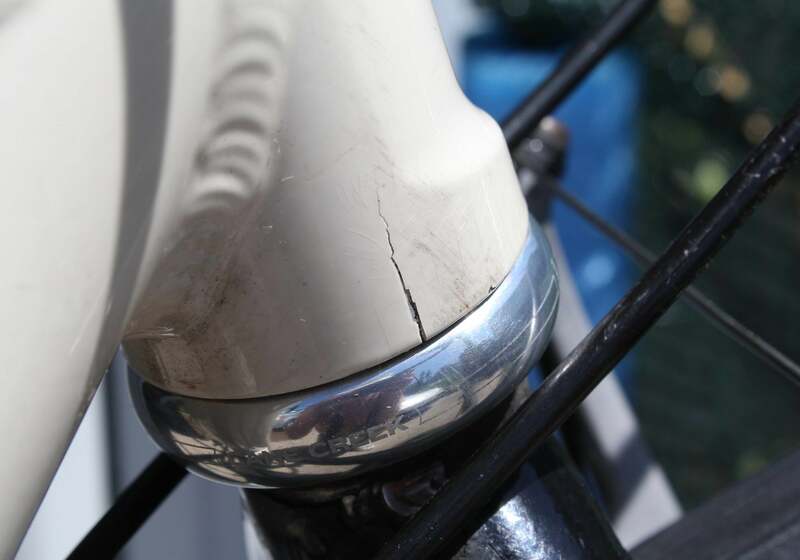 I can give you an answer to your last question, since any bike shop can tell you that they have seen plenty of aluminum frames that have cracked from fatigue within a year or two. Consequently, we know that those riders are producing stress cycles far beyond 1ksi (i.e., 1,000psi). 1. The ultimate strength (tensile strength) of high-quality aluminum tubes used in bike frames is on the order of 60ksi. 2. Some strong riders manage to break frames made out of such tubes within a few years of normal use. 3. Even though aluminum has no fatigue limit, its S-N curve is high above the horizontal axis (indicating stresses that are a high percentage of ultimate strength) for a huge number of cycles (the horizontal scale — number of stress cycles — is logarithmic on an S-N curve). From these facts, we can certainly say that those tubes, in order to break within a few years of normal riding, are experiencing stresses on the order of at least 30ksi. Add loaded packs to the same bike with the same rider and the stresses go up and the frame’s life is even shorter. Since any bike survives the vast majority of rides that its rider embarks on, and Gary’s has survived 24,000 miles, chances are that his will survive this trip, too. But he asked me if the number of miles on the frame is a practical concern. Since it is aluminum, which has no fatigue limit, every single pedal stroke, and hence every mile traveled, is indeed a practical concern, because every one of them shortens its life. I still have no idea how long that life will be, given the dearth of data about him and his bike that I had to work with, and I said that. My point is that the unpredictability of it lasting the trip or not increases when using a material like aluminum that has no fatigue limit. If he instead had a steel or titanium bike (which have fatigue limits), and we were able to measure that the stresses he is providing on its steel or titanium tubes were below 30ksi when on his loaded tour, I could guarantee him that a well-made frame without notches, dents, or corrosion would not fail from fatigue during his trip. That’s because titanium tubing used in bike frames has tensile strength on the order of 100ksi, and steel tubes in quality bike frames have tensile strengths of 125-200ksi, so 30ksi is well below the fatigue limit (typically around half of tensile strength) of those tubes.